String Theory is well under way now. Hanson has a full US tour under their belts, and the album and its various packages have been out since November. After receiving the 2019 Back to the Island itinerary, I feel compelled to rework Zac's original post and share some personal suggestions. Think of this concert as something wholly different than your average String Theory show. There will be obvious changes, like probably doing the entire thing without, you know, strings. 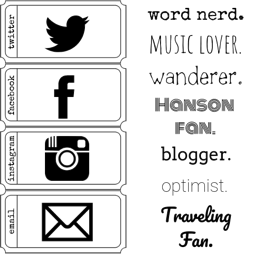 Actually, we don’t know that for sure, but let’s pretend for the sake of this blog post. Pretend like you're going the see the symphony, but without the symphony...oh, that was easy! 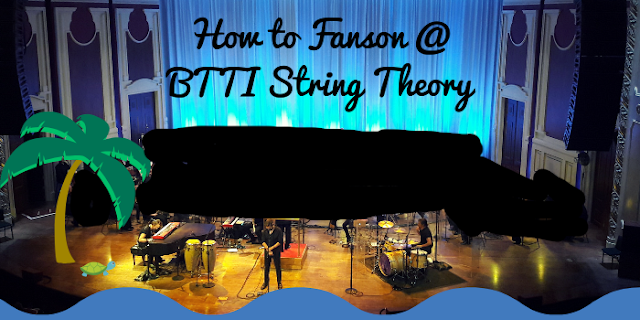 If BTTI will be your first String Theory show, think of it like...not String Theory. Let’s call it No-String Theory. Enjoy dancing on the beach. Literally reach for the sky, if you want. Get drunk and make sand angels. And then promptly forget all of this behavior and make sure to read Zac’s guide, “How to Fanson @ String Theory,” before you attend your first “real” String Theory show in the confines of a concert hall. Also, no amount of sand or alcohol will ever make catcalling appropriate. You can still leave that at home. For those who are inclined, there are some key musical moments that I will highlight where fans can embrace this unique String Theory setting for one time only. We’ll actually be under the sky (weather permitting). Go ahead, be cheesy and reach for it as if a pull-string cowboy told you to. You're not cemented to seat D15, so go ahead and do a twirl during the "round and round" part, and own that string bikini like it's every bit as festive as a galaxy-themed ballgown. The person behind you can move nine rows back, stand in the ocean, or go to the bar if they don't like it. Grab a drink and a friend, run into the edge of the water, and sing it loud the way you have for years. If you’re enthusiastic enough, you can almost (but not really) hear the strings. Laugh to yourself at the irony of this one. Tragic(ally missing) Symphony. You’ve always wanted to act this one out and pretend to respond to the eerie call to wander into the rocky sea, right? No? Only if Taylor asks? Fine, maybe in daylight. Maybe pretend like you ARE in a music hall for this one. A.K.A. Shut up and listen. Wait, will there be an intermission? Time for a bar run, or make friends in the Level rooms for quicker bathroom access. If you’re late coming back, at least you already heard Reaching for the Sky Part 1. Belt out the last line for this one. There’s no room for underachievers here. I know you want to record this one, but just remember, if your iPad is above your head, it's too high. Actually, a better rule of thumb is if your iPad is on the beach, go put it back in your room. NOTE: Feel free to stay standing from this point until the end of the show, because I really doubt you were sitting. I know a lot of you are thinking of this as your only shot to stand and dance the entire time through String Theory, but as a lazy person, I'd like to point out that it’s also your only shot to lay down the entire time in a reclining lounge chair. Your call. No instruction here, just a friendly reminder that you're going to be searching for more than the sound of light when you're trying to walk back to your room in total darkness after the show. You’re probably really drunk by this point, so go ahead and belt out the “Don’t Wait For Tomorrow” part like our lives depend on it. I promise, you sound as amazing as you think you do. The real thing is to treat the show as a surprise an opportunity to experience the music in a unique way just this once, whether that means getting traditional String Theory with sand instead of chairs, or an unconventional version with energy and dancing instead of an orchestra. Whatever your initial reaction to the announcement, String Theory: BTTI Edition can be a good time if you want it to be. Waves, catcalls, and “don’t step on the turtles! ", there is a lot to listen for. See you all soon on the island! Disclaimer: Satire + Zac's Original Blog Post + a childhood love of Mad Libs = This post. Please don't take it too seriously. So this would be the right night for my nsync no strings attached shirt, right?